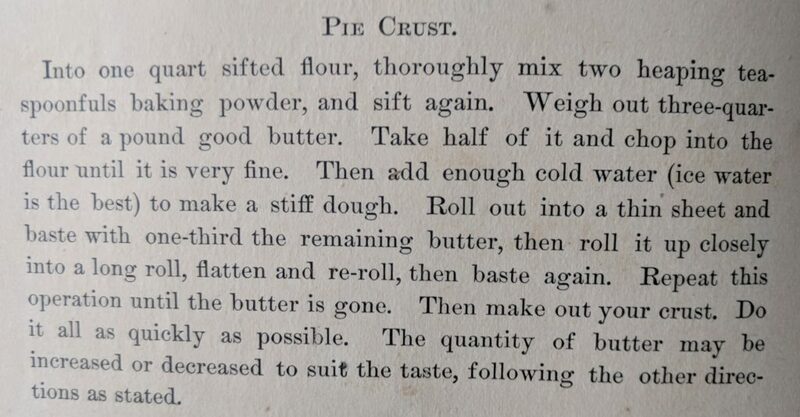 In the 19th century, shortcrust pastries similar to today’s were not the only type of pie pastry, not even the dominant majority. Every book had multiple pastry recipes, and puff pastry was often the first. In my experience, making puff pastry is an outright pain. Yet it is implied that housewives of the time made it frequently. This particular recipe from The Successful Housekeeper is a curious combination of a shortcrust pastry and a puff pastry techniques. This starts out like a typical shortcrust pastry, until you roll it out the first time. Then it diverges into something related to a puff pastry. By spreading it with butter, then rolling it, you create several layers all at once. Then, roll it out and do it again. I made a batch of this today, and no question, if I do it again, I will make adjustments from my normal routine. Normally, I make my pastry with just enough water to barely hold together, and I work it as little as possible. That was a problem in this case, with so much butter in it, it made it difficult to keep it on one piece. So, next time, a little more water, and I will probably knead it just a bit before rolling it out the first time. I did end up chilling the dough a bit between stages, as it just go too soft and sticky to work with. You’ve got to be pretty liberal with the flour too. So, how did it turn out? Quite good, really. It was soft and flaky, and very buttery. But nothing like a puff pastry, just a very flaky shortcrust. But the question is, is it worth the extra work over a good standard shortcrust? That’s much harder to answer. I’d say it was better than my standard shortcrust, but not a lot better. Which may be why the technique was unknown to me until now.